For those who don't like stranding, this hat is worked with slipped sts, and only one color is worked at a time across any given row. 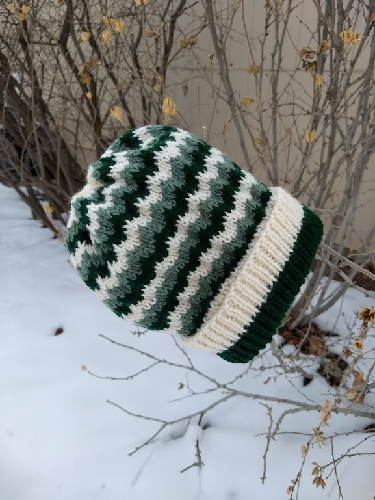 The slipped stitch technique makes the hat extra warm, as it pulls the rows tighter together to form a more compact fabric. It also creates a gentle wave effect instead of a zig-zag that you would get from working it in the Fair Isle technique. Materials: Worsted weight yarn in colors A, B, and C. (Model was made with Red Heart yarn, colors: Aran, Green and Sage); 16-inch circular knitting needles, sizes 4 and 6 (U.S.); Double pointed needles, size 6 (U.S.); tapestry needle. Gauge: 4 1/2 sts/inch in stockinette stitch in pattern on larger needles. Note: Hat is worked in rounds, and colors not is use are carried loosely up the back side of the work, making sure to always bring the new color into the work by pulling it up and to the right of the strands you are not using. With smaller needles and A, cast on 100 sts, and join into a round, being careful that sts on needle are not twisted. Work in (k1, p1) rib for 7 rounds. Change to color B, and rib 16 rounds. Change back to color A, and rib 8 rounds. With B, knit two rounds. Change to larger needles and begin Pattern. Round 1: With Color C, *k1, slip next 3 sts purlwise, rep from * around. Round 2: With Color C, *k2, slip 1 st purlwise, k1, rep from * around. Round 3: With Color C, knit around. Round 4: with Color C, knit around. Rounds 5-8: Repeat rounds 1-4, using Color A.
Rounds 9-12: Repeat rounds 1-4, using Color B.
Rep rounds 1-12 for pattern. Work in pattern until hat measures 8 1/2 inches. Decrease Round 1: (K2, k2tog) around. Decrease round 2: (k1, k2 tog) around.. Decrease rounds 3, 4, 5: k2tog around. (if there is a single stitch left at end of round, just knit that stitch.). Cut yarn with a 12-inch tail for sewing and thread yarn onto a tapestry needle. Thread it through the rem 7 sts of hat and pull tight. Secure.